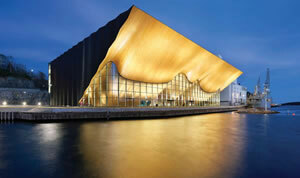 Kilden Performing Arts Centre is a theatre and concert hall on Odderøya in Kristiansand, Norway. 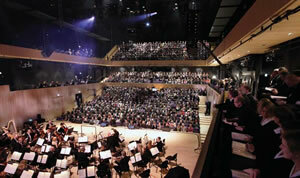 It houses Agder Theatre, Kristiansand Symphony Orchestra (KSO) and Opera Sør. The building was built and is owned by Kilden Teater - og konserthus for Sørlandet IKS, Kristiansand Municipality and Vest- Agder County. Construction began in 2007, and Crown Princess Mette-Marit of Norway laid the foundation stone in 2009. The Centre was finished and officially opened on 6 January 2012. The project architect was ALA Architects of Finland, Brekke & Strand the acoustic consultant, the acoustic design of the concert hall was by Arup and the main contractor was AF Gruppen. 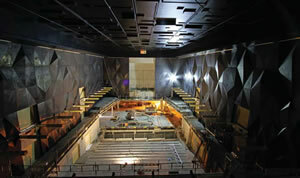 The internal GRC acoustic panels were designed, manufactured and installed by Byggimpuls of Norway. The building has a gross area of 16,000m2 and a volume of 128,000m3. The building cost was close to NOK1.7 billion (£171m). Logistical constraints – why use GRC? Originally GRC internal acoustic panels were not planned for the project. But according to Torstein Lange Larssen, project manager with AF Gruppen, there were challenges to overcome. Initially the internal acoustic panels were to be delivered as a precast concrete solution manufactured in the contemporary manner with distribution and reinforcing steel work cast into the elements. However, to deliver these elements as precast concrete raised some technical and operational issues. The first issue was one of mass: if the elements were to be solid precast then the weight of the units, some of which had a surface area of circa 18m2, would have been very large. The alternative GRC solution offered units indicating a reduction of 50% or more in weight. This allowed for the on-site cantilever crane facilities to handle the lifting and installing of the elements and negated the need for a large mobile crane to be brought in. As the acoustic panels were internal they had to be craned in from above through the structure’s roof aperture, which put the installation of these units on the project’s critical path. Therefore speed was also critical; the GRC panel and fixing solution provided by Byggimpuls allowed easier micro-positioning of the elements onto the support details and thus delivered an installation programme more favourable than that offered by precast concrete panels. In addition, the surface geometry of the acoustic panels was extremely complex and the finished concrete surface had to be of high precision and supreme quality. This was a challenge that was easily met by using GRC, which is a very compact, dense and closed concrete matrix when considering surface finishes. The desired colour of the panels was to be black, which could be achieved using GRC and gave the added benefit that the elements were through-coloured. Given the complex nature of the surface panel geometry, specialised 3D software was used to design the panel elements and assess their structural integrity using finite-element analysis techniques. The use of GRC made it possible for Arup to design the panels to exact thicknesses necessary to achieve the best acoustic outcome. Manufacture of these units had to be extremely precise and the depth/thickness of the elements had to be within a very specific tolerance at any point on the surface. For Byggimpuls to deliver the required surface finish to the acoustic panels required very careful and skilled preparation of the units’ mould work. Specialised mould liner components were sourced to deliver the correct level of quality, accuracy and consistency. For the acoustic panel support details a cast-in Halfen profile was predesigned and cast-in to the in-situ concrete structural wall detail. The installation of the units had to be extremely precise – the allowance for the vertical and horizontal joint sizes was ±2mm and this could only be achieved by designing a support and restraint detail with excellent fine adjustment in the X, Y and Z axis. A large proportion of the installation took place during Norway’s harsh winter conditions, which often delivered snow, freezing rain and very high wind. Despite this, the team from Byggimpuls, led by Odd Age Steine, were able to keep on programme and install the units to the very exacting standards required by the project. After 142 panels were manufactured and installed the project was complete. The GRC acoustic panels supplied ranged in size from 2.6 × 4.2m to 2.6 × 5.2m. All were installed on time, not affecting the critical path of the overall construction project. If the solution had remained one of traditional precast concrete then more operational resources would have been required, affecting the project’s budget, overall programme and risk profile. GRC elements helped to eliminate this risk and deliver an overall solution that more than satisfied the very high level of precision and quality required by such a scheme. In recognition of the service provided by Byggimpuls, the company was awarded the Betongelement Prisen I Norge 2010.